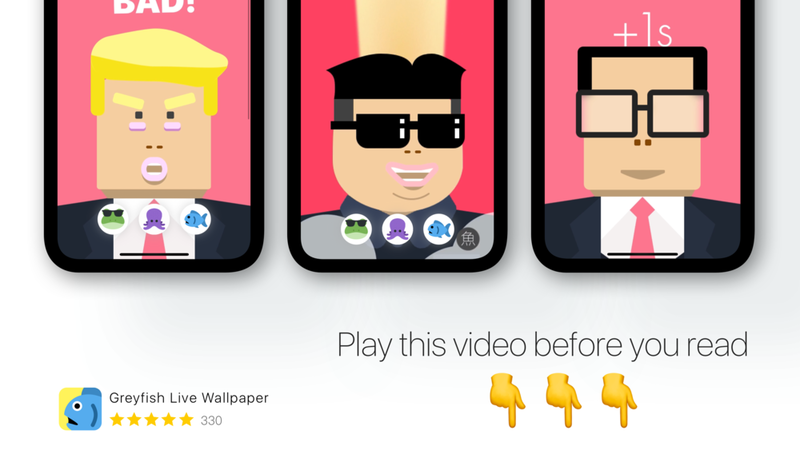 Greyfish Live Wallpaper, a funny parody of politicians. Greyfish Live Wallpaper is my personal created wallpaper sharing platform about parody of politicians. Users can download 4 different designs, 1-3 color for each, a total of 9 live wallpapers designed by me here. Users can also create their own live wallpaper by simply select one of their videos. The app can make it into animated live photo. Now this app has a total of 323 reviews from all 155 countries and regions around the globe with 310 5-stars reviews. The number is still increasing everyday. 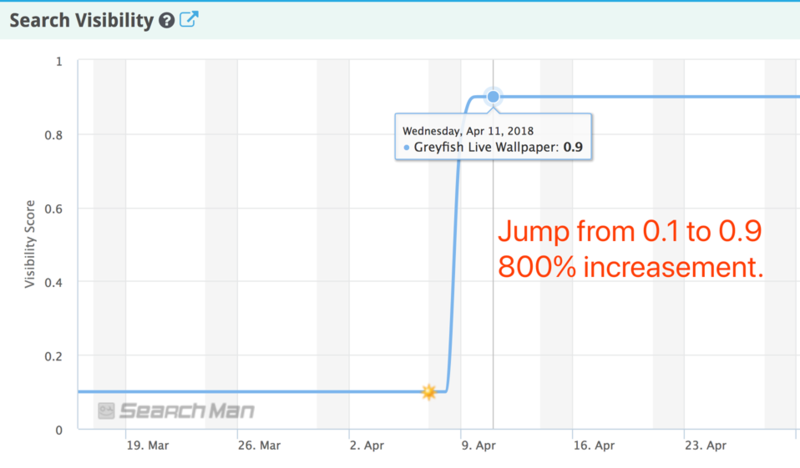 Greyfish Live Wallpaper is an on-sale iOS app initiated, designed and developed by me and my college friend Edward. I came up with the idea, created the first prototype and Edward coded with Swift in Xcode. Then after several weeks of review and recalibration, first version is released on Feb 25. Till now, the app has been iterated 4 times from version 1 to version 2.3. Install the app with the button below. 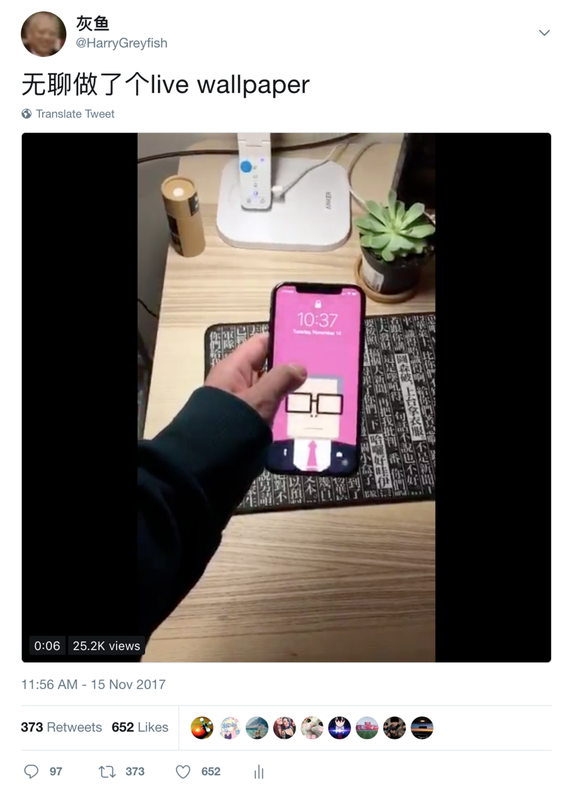 One day in November of 2017 I was browsing Twitter and I saw one guy showing a video of how he animated the lock-screen with 3D touch on his iPhone. I never owned a 3D-touch enable phone till I got my iPhone X that October. I was immediately amazed by it and started making animated phone screen sized pictures. At 11pm that night, I finished my first wallpaper. At 11:56pm that night, I uploaded a video to Twitter. You can visit my tweet via the link on the right. As I woke up next morning, my follower grows from 1 person, who is Edward, to 650. Within 3 days, the number hit 1000. That is phenomenal. Then I created other wallpapers in the following weeks, including Mr. Trump and Mr. Kim. Live photo is a distinct file format. It is an Apple own format and it is extremely hard to share on internet unless you use Apple platforms such as iMessage or Airdrop. In order to fulfill my followers need, I can’t send 1000 iMessage all by myself. Then I came up with the idea of creating an app so people can download them from it. Lock-screens and wallpapers are meant to be full-screened. They serve both as a landing screen and a background for everyone’s most frequently used daily machine. So full screen, or in another way, immersive experience is hugely important when thinking about design. By swiping up and down, user can switch between different wallpaper designs. By swiping left and right, users can see different color variations of one design. Instead of using traditional tab bar at the bottom, I designed it into action buttons to trigger different action pages on top. 🐙The octopus is the animation button. User can use animation tool to create own live wallpaper using videos in the album. 🐟The fish on the right is my personal contact page. I also hid two easter eggs in that page. One is a hidden wallpaper. By tapping the logo 3 times, a hidden design will be automatically downloaded into user's album. This wallpaper is about a parody of a previous leader of China, Jiang Zemin. (It is dangerous to put it on the front page since this app is on-sale in China AppStore too). The second one is a game called Flappy Eld, a parody version of Flappy Bird but about Mr. Jiang too. How do we develop and solve problems? Xcode is the primary tool we used. We also used dropbox for instant file sharing. The first version was out in January. It provides 2 wallpapers with very limited functionality. Initially I tried to put data on Firebase so we can update wallpapers without submitting newer build but Chinese government blocked almost all Google services and Firebase was blocked too. So Chinese users can only see black screens instead of actual wallpapers. Also our team has conflicted some Apple Appstore rules too. Such as repetitive names and app builds (we submitted international and Chinese versions at the same time to prevent us from censoring), . After several weeks of emails and finally a phone call, we successfully to resolve all the problems and the newest version was pushed online in April. We never imagined a simple app like this could be this difficult to publish. I personally am in charge of the marketing part too. As I researched, 60% of future app adopters guided their way into app by simply browsing or searching on AppStore. I studied ASO, AKA AppStore Optimization. I optimized the app title by putting hottest trending words. Also I put as many as keywords into the app description in order to maximize the chance to be searched. All these attempts truly helps to list our app as top as possible. Besides ASO, I am also trying to promote through social media. I contacted one of the largest indie app recommendation website in China. They pretty like our app. They listed us on their homepage, which gives us a big jump too in the middle of April. At first users can download all wallpapers freely. But in version 2.2, users have to share the app before they can download it. This greatly helps share rate and let more people know our app. We also used Fabric to trace user increase grow rate, daily new users and crash rates. By integrating this tool, we are able to get instant feedback on our marketing moves to check the effectiveness, much easier to direct our plan. The team is looking forward to upscale this app into broader user group, making it into a platform for sharing user created live photos. Due to server load and complexity of the app, we can’t fully upscale it into a total open social app. 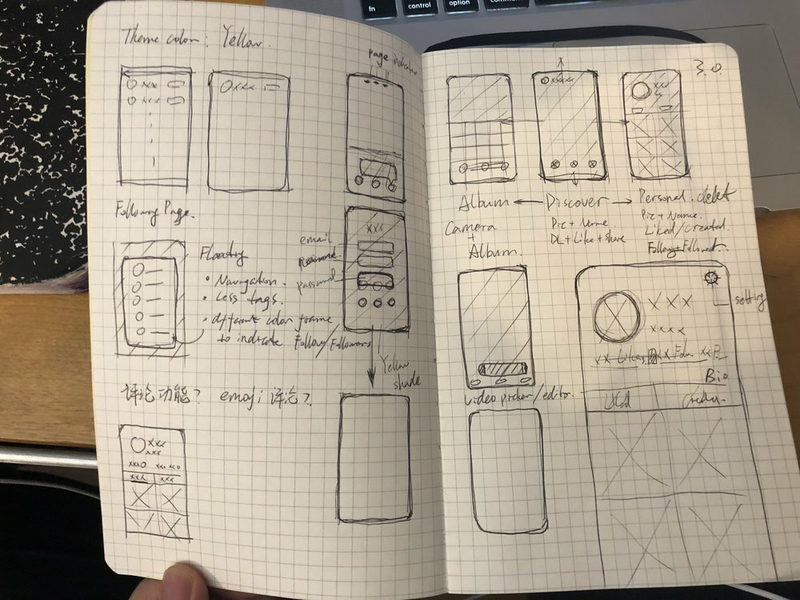 Ideally we are making into a semi-open platform, meaning that the app doesn’t recommend content by algorithm but simply provide following function for users. Users may able to share content links via third party apps. The team is going to an official account on it to give out official made wallpapers and the app can only show official account’s liked wallpapers, serving as a manual recommendation option.